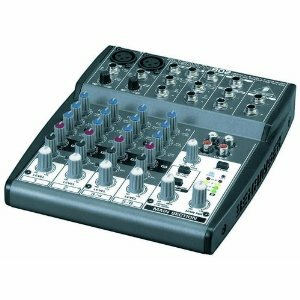 Is this behringer mixer the one you should buy for you home recording studio. In this Behringer Xenyx 802 Review you can see that it is an inexpensive mixer for home recording and is a great mixer which is a fantastic value for the price. The mic-presets are great and give a clean full sound. When used for vocals the noise level is very quite. Acoustic guitars sound great through this mixer too giving a warm natural sound. It really does sound good and has lots of punch and volume to spare. The build quality for the price is good. It has a metal face and plastic sides. I would of perfered metal side as well but for the price they had to cut corrners some where. The knobs are smooth and don't have any play in them at all which is a good thing because I feel they will last. The BEHRINGER Xenyx 802 mixer can give a small multi-vocal performance a full sound. You get a lot for a low price: 550 watts, built in EQ, small profile and with handles. The Behringer Xenyx 802 has 8-input, 2-bus mic preamps with +48 V phantom power, so you can use two dynamic or two condenser microphones. It has a three-band British EQ which gives a warm, musical sound. You can see in this review that the Behringer Xenyx 802 mixer has effects send and return jacks so you can hook up to an external effects processor for even more control over the output. You can play pre-recorded music through the RCA CD/Tape inputs and then record your performance to an outboard recording device through the RCA outputs. The Behringer Xenyx 802 Review says this mixer gives optimum sound quality which is easy to opperate and very affordable. Hopefully the Behringer Xenyx 802 Review has show that the Xenyx 802 is a great mixer and one that you should put on your short list.